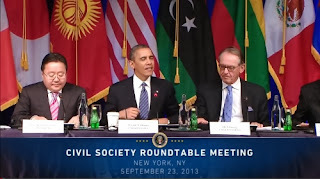 At the UN General Assembly, President Obama meets with heads of state and leaders of civil society, multilateral organizations, and the philanthropic community to discuss growing restrictions being placed on civil society organizations (CSOs) worldwide. The event marks the beginning of a year-long effort to further intensify our work to support and defend civil society from a rising tide of restrictions. September 23, 2013. The Executive Director of the Centre for Policy Alternatives, Dr. Paikiasothy Saravanamuttu, was also invited by the White House to participate the meeting, hosted by President Barack Obama.